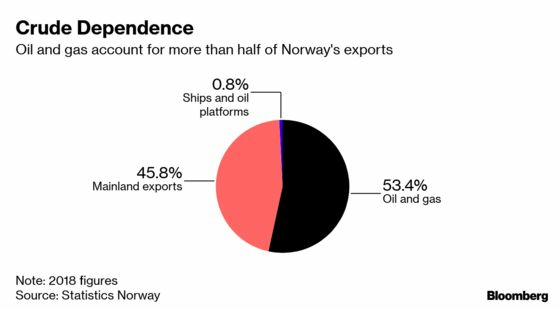 (Bloomberg) -- Norway’s oil industry, already under increasing pressure from opponents of drilling, is in for a tense week. The opposition Labor Party, the country’s biggest political group and long-time backer of the industry, is holding a congress starting on Thursday at which oil opponents look poised to push the group to abandon its support for activity offshore the sensitive Lofoten islands in northern Norway, all but killing the industry’s remaining hope of ever producing oil and gas in the area. On the face of it, the move wouldn’t change much: political horse-trading has kept the area off limits for years, and it’s not thought to hold more than 3 percent of Norway’s remaining oil and gas. Yet the repercussions could go far beyond Lofoten. Labor is backed by the biggest unions and has been a reliable ally for Norway’s biggest industry since oil production started in the 1970s. A shift by the party would mean a solid majority in parliament to keep Lofoten off limits. The oil industry fears that if Labor abandons Lofoten, it could be willing to compromise on other issues the next time it forms a government, such as the petroleum tax system, licensing policies or exploration in the Arctic Barents Sea further north. Even if Labor says it’s committed to maintaining stable policies for oil companies, statements from party officials have raised concerns in the industry over how long that will last. At a time of rising concern over climate change, that uncertainty compounds other challenges for the industry, such as lower public support, potential electoral gains by oil opponents and legal threats mounted by environmental groups. On Lofoten, Labor already restricted its position in an internal compromise in 2017. Now, 10 of 15 regional party chapters either want a permanent drilling ban or to stop advocating for a so-called impact assessment, which is a required step to open new areas for exploration. Those chapters hold 213 of 300 delegates at the party congress April 4-7, where a vote will likely be held on the issue. A possible outcome could be a resolution stating that Labor no longer seeks an impact assessment but also doesn’t favor a permanent exploration ban, a person with knowledge of the party’s inner workings said, speaking on condition of anonymity. Espen Barth Eide, Labor’s top energy lawmaker, declined to comment on the Lofoten issue. He said there was no push within the party to change the country’s oil policies, but that Norway needed to accept that it will rely less on that industry going forward.